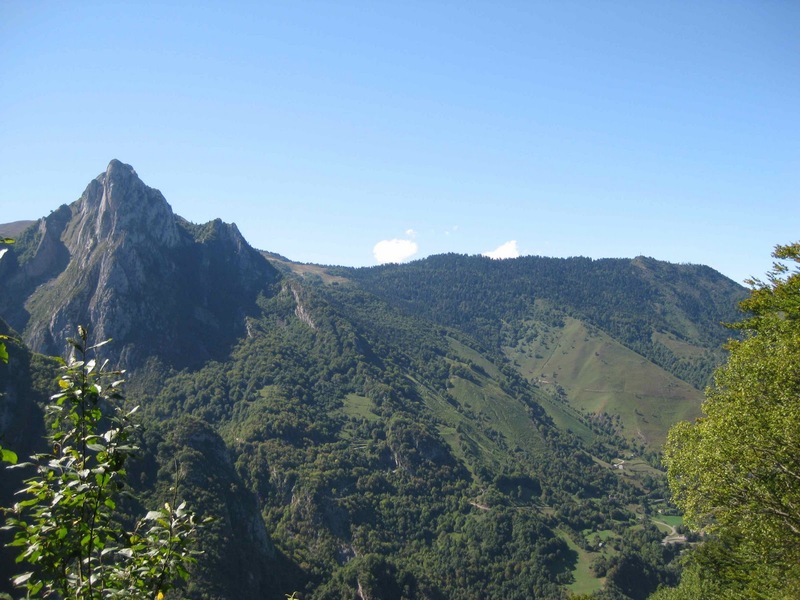 Still thoroughly dysfunctional, I grabbed onto A’s ice-axe loop and he pulled me up the remarkable Chemin de la Mâture (usually translated “way of the masts,” though I think “mast path” or “mast road” is more idiomatic). 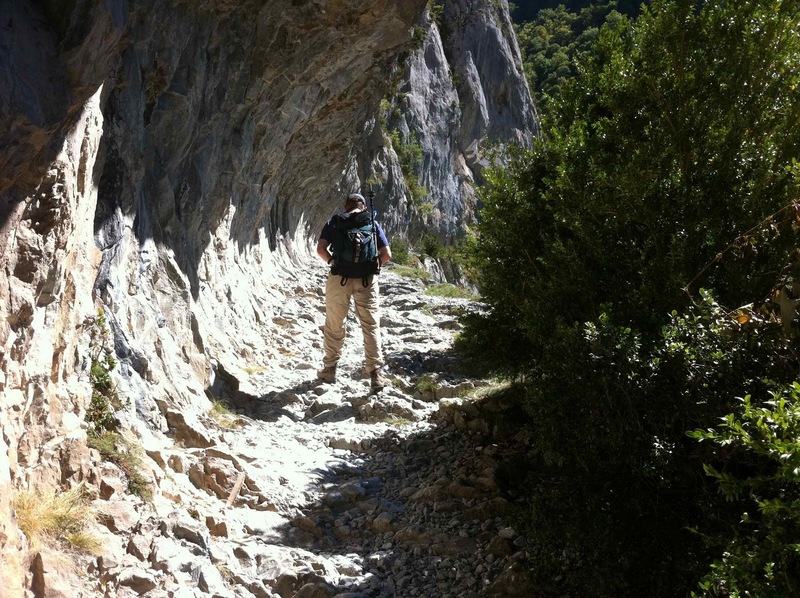 This is a trail essentially blown and carved out of a cliff face so the 18th century French navy could roll masts for King Louis’ navy down from high forests. 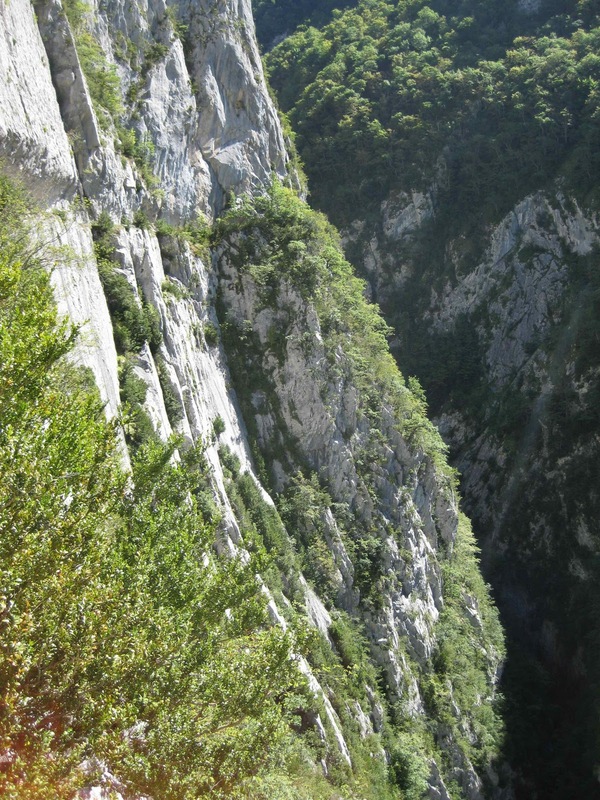 That’s the Chemin, about a fifth of the way down from the top of the photo. Hardly looks like something you could walk across, does it? 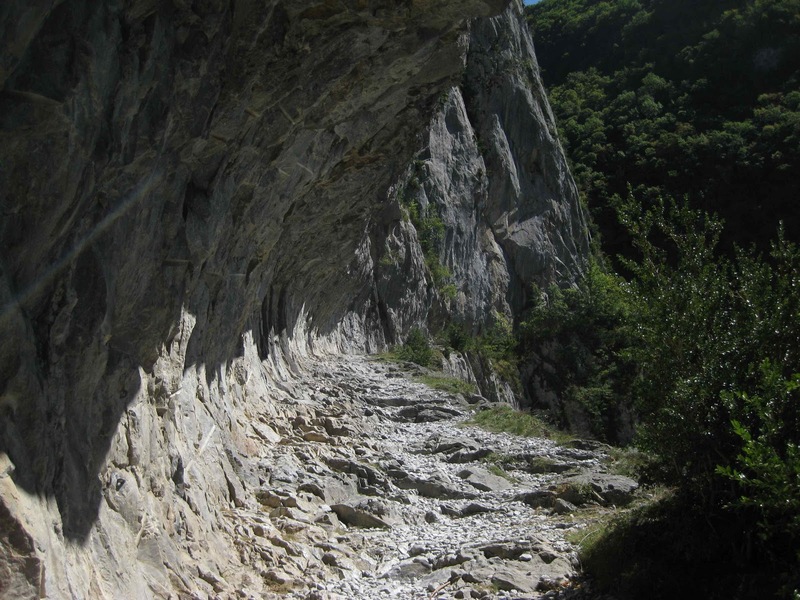 The chasm off to the right is known as les Gorges d’Enfer, (gorge or gorges of Hell). It’s not quite so bad once you’re on it. But, partly due to my whimpering and whining, we got a late start, and hit the cliff in full, direct sun. Dragging and moaning, I steamed my way slowly up. I don’t remember ever feeling so awful in the hills. 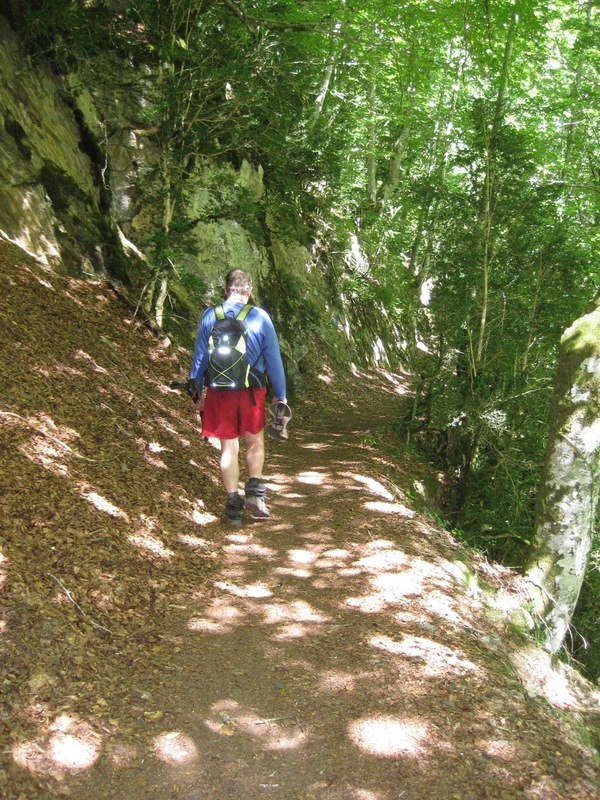 We were, in fact, about 90 percent of the way along the Chemin proper. Afterward, things got cooler and easier as we carried on to complete a loop back to the road. This is a view of the ridge A had walked over the day before. 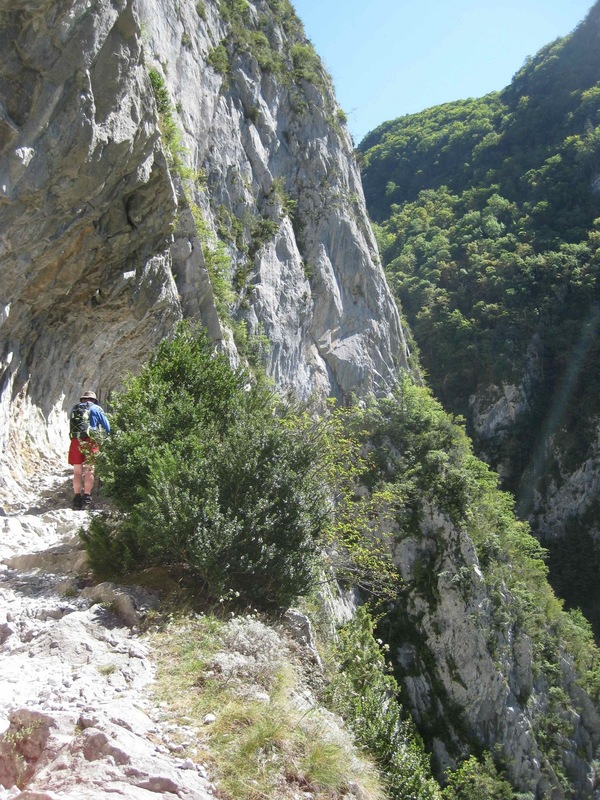 The Chemin de la Mâture is a famous and interesting walk and we enjoyed it—A thoroughly and I provisionally. As usual, and despite my turtle’s pace up, we were much faster than the books and signs suggested, so we were sitting in the local cafe when our chauffeur drove by on her way to collect us at the trailhead, and we waved her in for a beer. It was good. I was offered that particular route and gave a polite refusal. I would't have gone any further then the view in your first picture. Think the video's fixed, Alan. Thanks for the tip-off.